Hexascroller has been a central fixture at NYCR for the past few years, with a few ups and downs. It’s replacement, Octoscroller, improves on our classic message alert polygon by having two more sides and two more colors of LEDs. The userspace application renders images into a shared memory frame buffer, or in this case receives UDP packets containing video images from the Disorient Pyramid transmitter. The PWM algorithm can do between eight and sixteen levels of brightness for each color, producing approximately 12-bit color. See it in person at MakerFaire in NYC this year and read on for details of how to wire up a driver for the panels, as well as a walkthrough of some of the PRU code. The brains are a BeagleBone Black running the LEDscape custom PRU firmware. The AM355 CPU in the BBB has two separate realtime microcontrollers built into its die, both with full access to the GPIO lines and cache coherent access to main memory. This bit of hardware/software allows the user application to simply render into a frame buffer, which is then driven to the panels by the PRU. 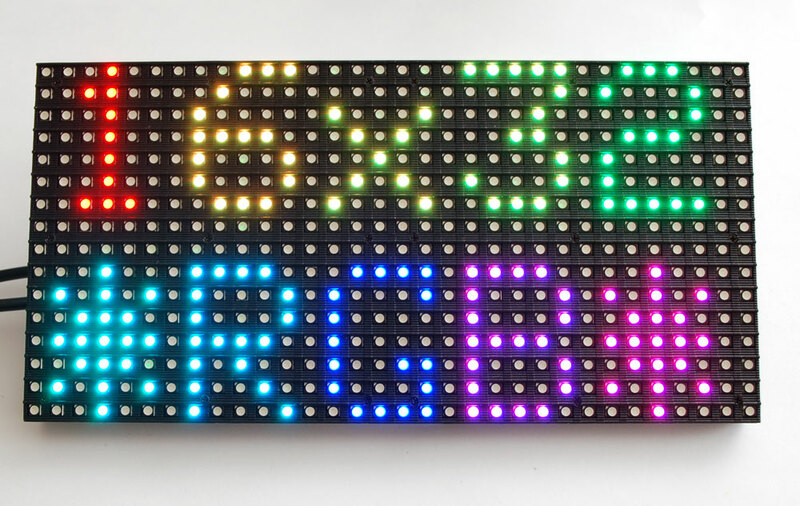 The key component of Octoscroller are these 16×32 RGB LED panels from Adafruit or Sparkfun. Unlike the popular WS281x LED strips that have their own PWM hardware builtin to each pixel, these panels are very inexpensive since they require continuous refresh by an external driver. The Arduino firmware can only drive a single panel and consumes a significant amount of CPU interrupt time to maintain the image. With LEDscape, the BBB can drive up to four chains of four panels each at 0% CPU load. Powering the panels and the BeagleBone WAS a 5V 10A DC supply, but it turns out that each panel draws up to 2.6 amps in RGB mode and 3.5 amps while displaying full white. The panels are built as six parallel shift registers, each with 32 bits, and twelve 16-channel constant current LED drivers. The connectors have six data and six control inputs each: R1, G1, B1, R2, G2 and B2, and A, B, C, CLK, LTC, OE. The three address select lines, A, B, C, select which two rows are currently displayed (0/8, 1/9, 2/10, etc). On each falling edge of the CLK line, a new bit is shifted in on the six data inputs. On the falling edge of the LAT line, the new data is latched and, when OE is held low, displayed. To save on GPIO lines, the PRU shares the control lines between all output chains and only needs the six additional data lines per chain. If the HDMI hardware is disabled then four chains can be driven by the single board. // of the previous row, not this one. However, this duty cycle is only if the pixels are fully on or off. To create variable brightness using PWM requires that the panels be rescanned at a much higher frequency so that there can be more variation between the levels. In practice I’ve found that a maximum of four can be chained together and still retain decent performance (eight levels per pixel) or two panels with sixteen brightness levels. My current PWM algorithm uses the !OE line to toggle the display off after a few pixels on the next line have been clocked out. This seems to work fairly well, although I’m sure there are improvements that can be made. Want to build your own? We’ll have a class on it sometime soon that will include all the parts and a custom BeagleBone cape to make your own network attached low-res colorful polygonal display device. There are now circuit boards for driving up to eight chains of eight LED panels each. That’s 64 LED matrices for a mini-jumbotron! Once we have more panels house, we’ll have an announcement for signups for the class. What is that IC on the Octoscroller? 74245 octo-line driver. The seven control lines are shared between all eight output ports, so this helps with the fanout. Can you post your code? Thanks! Hi! can we buy the octoscroller somewhere? Just to be sure, how many 32×32 rgb led panel can we drive with the octroscroller 1, 8? would daisychaining several 32×32 together be any different in the coding and wiring compared to those 16×32 ? same question with octoscroller 2, can we buy it? Just wanted to confirm the components for the board. So I would need 3 different parts correct? 8 connectors for the LED panels, 2 connectors to attach to the BeagleBone, and the IC. Correct? is there any instruction on how to install the custom firmware on the beaglebone. Im new to beagle bone. Are there instructions for assembling the Octoscroller and installing the firmware? Any instructions or resources for connecting the pins on the beaglebone black to the led matrix?